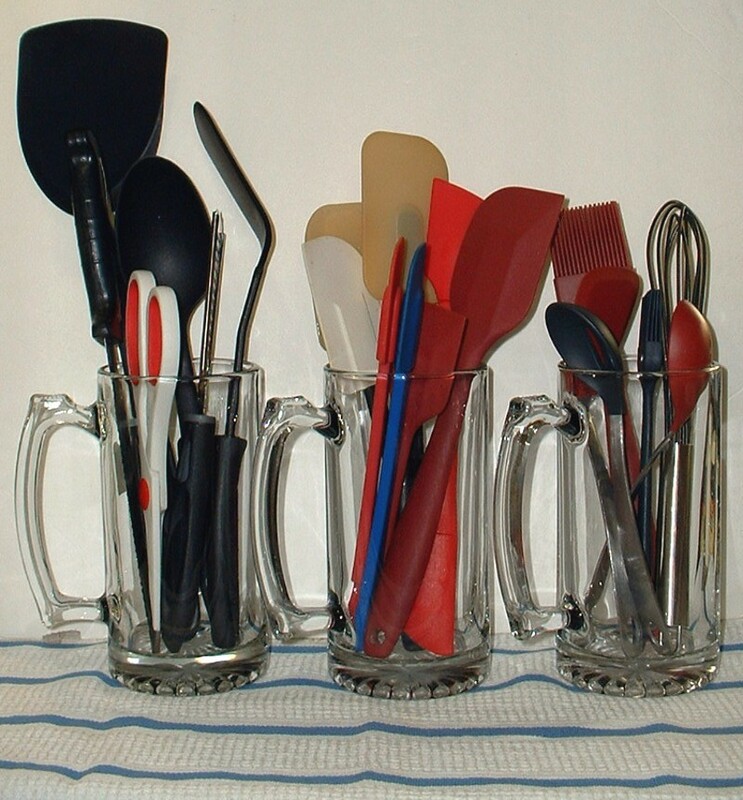 Kitchen utensils are all different shapes and sizes, which can make them difficult to organize. Well organized kitchen utensils makes it easier to find them and can also add a decorative element to your kitchen. This is a guide to organizing kitchen utensils. I've seen a lot of good ideas here on storing kitchen utensils and decided to post my own. I bought these beer mugs at Dollar Tree for a dollar each. With care they'll last a lifetime. They are heavy and will not easily tip over. They take up little room and are handy. Best of all, they are at a very Thrifty Fun price. I thought about decorating them somehow, and I may. But, as they are, it's very easy to keep them clean. I used Juicy Juice cans to hold my kitchen utensils. I put them in a wire basket that I found for 50 cents, added the magnets and bingo, a multipurpose rack. You can decorate the cans any way you want, screw them into the wall or leave it on the counter. I always find ways to create more space. I always hate things out of place, especially things that can grow germs. What could I do? Everyone has sponges, wash clothes, soap, etc. next to the kitchen sink or worse below it where it's dark and damp. One day I had had it. After everything else was looking clean and sparkling, was my sponges, my cleaner, the drain stoppers, and it didn't look clean to me at all. I knew there had to be a solution. One day I was in the bathroom, I looked at a friend and said, "I know a bathtub holder would have room for all of that stuff". She knows me very well. I explained which kind I meant. Not even 2 days later, she came bearing a gift; my new kitchen organizer. I hadn't ever seen this anywhere before but usually when I put my mind to something, I figure it out. They are used in the bath area for shampoo or soap. In my sink, it is for one sponge (that I wash dishes with), one that has scrubbers, dish soap, and the drain stoppers. 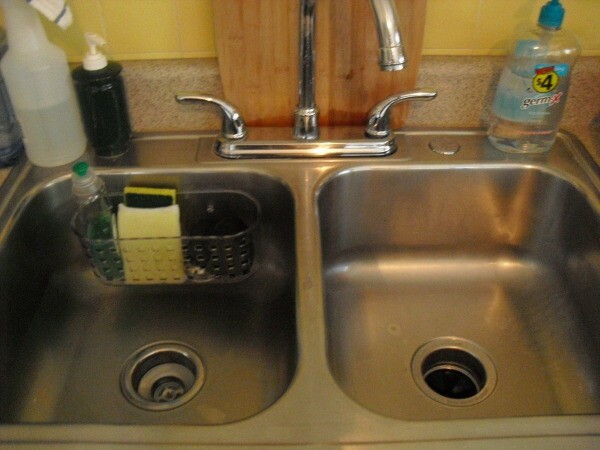 My sink look as sparkling clean as the rest of my house. This container has holes so it doesn't trap moisture, allowing the air to get to the sponges. The dish soap is right there not being knocked off in the rinse water, and I can get the stopper only when needed - perfect! I like the clear one because it looks clean. There are several colors if you would want to match your decor. They are plastic so are easily wiped out with my cleaner (vinegar, lemon). I use organic cleaners and it's great to have them next to the sponges. I also want to remind you that sponges are great. I don't know how I would get the dishes clean without them, however they hold so many germs. Make sure you put your sponges in microwave for 2 minutes, to kill all the bacteria. I do it right before bed so next morning they are all germ free. I hope this helps you out with the things that "live" around your sink area. I have hand soap, germ killer and my own hand made cleaner on top of the sink. Everything else is neatly placed in its own little basket. I think it looks exactly how it should have for all these years, when I couldn't think of what to do with them. I also use microfiber cloths to dry my dishes with. These are changed daily. Microfiber dries very quickly so during the daytime, the cloths dry out. I have my utensils on a small butcher block table that has a shelf underneath it. The utensils are stored in flower pots, a large terra-cotta roaster that had a crack in it, a crock, and a tin pail. I was tired of digging through a drawer to find the kitchen tools I needed. Then I got the idea to buy those inexpensive magnetic cup hooks and attach them all around my hood vent. Now the tools are at my finger tips, it looks nice, and I freed up a drawer for something else. I used the drawer for all my spices. While visiting with an ex-neighbor in her new home, she had to give me a tour of the place. The one room that was the most intriguing to me was her kitchen. My kitchen drawers need replacing badly. It is the two drawers that hold the heaviest weights, the flatware and large metal utensil drawers. 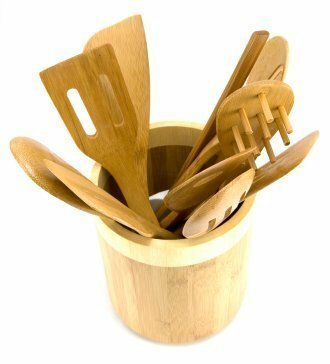 I used a basket to put all spoons together standing on one side, knives and large forks, spatulas, all other tools had their own places. When storing kitchen utensils (spoons, spatulas, etc.) in a drawer, having the handle facing towards the back of the drawer. That way you can easily see what utensils you have since many have similar looking handles. Just a simple rubber band and no more tangled tongs in the drawers. Wrap it around the top to keep them straight in the drawer. I use a large flower vase to store my larger kitchen utensils. It sits on my counter top right beside my stove. I have 2 large cooling racks hung on the wall between my stove and sink. I use 'S' hooks to hang the utensils on the racks. Everything is out and organized so you can see it and easy to grab when you're cooking. To maximize kitchen drawer space, put flat wear in matching or eclectic decorative mugs on the countertops, leaving an extra drawer free, and keeping your flatware handy for constant use. A cut down Gatorade bottle makes a nice holder as well. 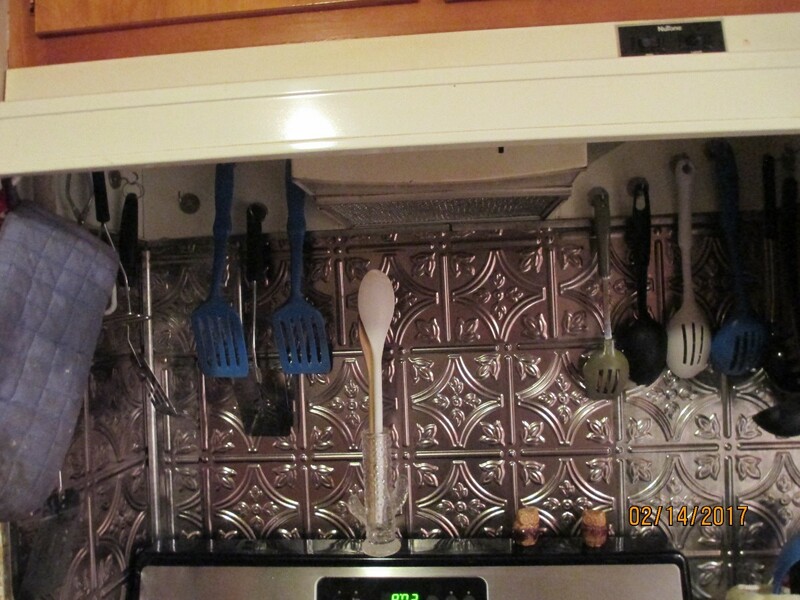 Where do you store your kitchen utensils like your large cooking spoons and forks, spatulas, potato masher, can openers, turkey baster, etc.? I have a small kitchen and would like to store them somewhere other than the wall and counter. Do you have any suggestions? The larger things that I don't use every meal are kept in some otherwise unusable drawers. These little drawers are long, but narrow and not too deep so I have 4 of them full of the larger things. I keep my large kitchen tools/utensils in a cookie jar minus the lid, right next to my stovetop. Other people on this site have used flower pots painted to match kitchen decor and decorated coffee cans for the same purpose. Be thrifty and be creative! Why not buy some hooks, the kind that you peel off the back and stick them on. Put them on the back of a door of you cupboards. Put them on a door that is not used that much. 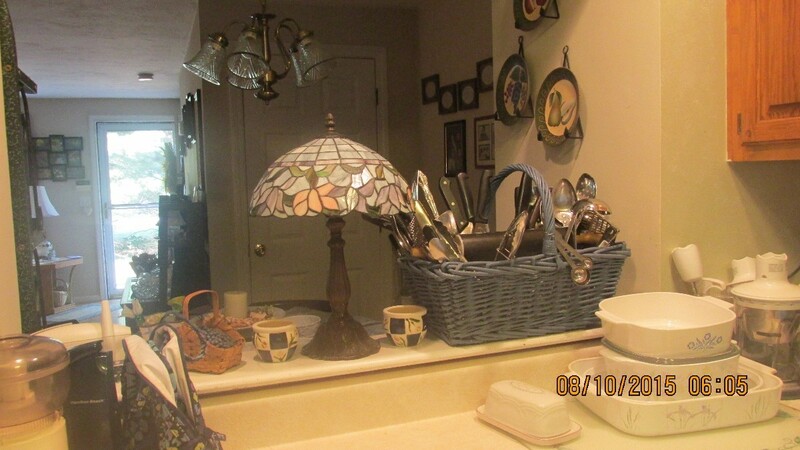 I pick up pretty cookie jars or ice buckets at yard sales and stand the utensils up, setting it on my counter. You can put a lot in, and it comes in handy to dry your plastic bags on (that no meat has been in). Also easy to find what utensil is needed. 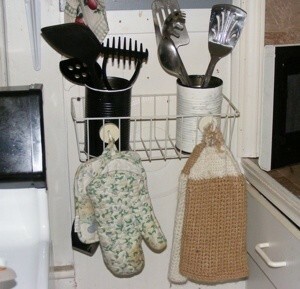 Look here for a brainstorm of ways to organize cooking utensils, that ThriftyFun readers did in 2005. While having lots of cooking utensils I didn't want cluttering up my kitchen drawers (ex. grill tongs, wooden spoons, slotted spoons, whisks, etc. ), I searched different stores for the 'exact' holder for them all. Never really finding what the correct size I wanted. One day while in a gardening section, I found a galvanized metal water pail with a few butterflies engraved on it. I knew immediately, I'd found my kitchen utensil bucket. I did have to put a small box into the center as some utensils will fall in completely, if I don't put them in towards the center. Otherwise, it fits my kitchen just fine! I use vinyl prepasted wallpaper as shelf and drawer liner and recently discovered I could cut paper towel tubes and cover with the same to store my utensils. It is much easier to pick up a tube than dig around a drawer. 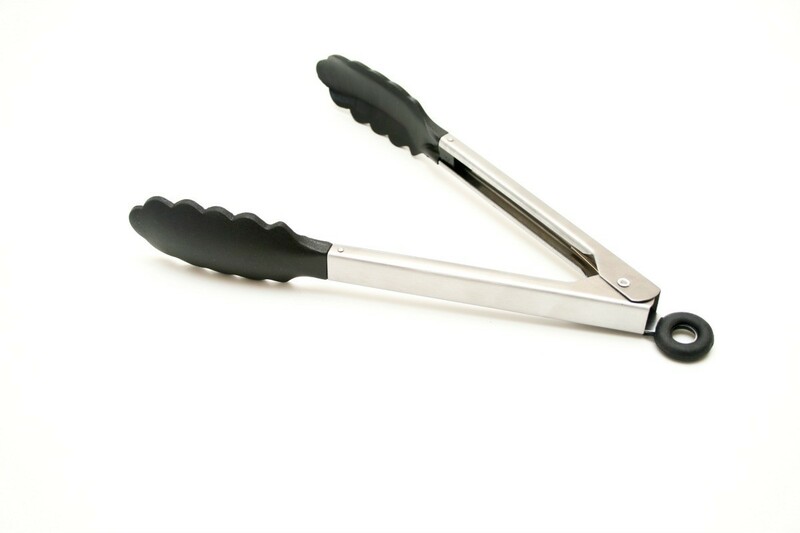 This is a guide about storing kitchen tongs. 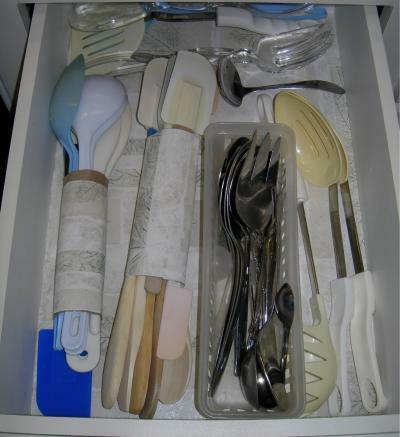 Cooking tongs can take up too much room and add to the clutter in drawers. There are a few creative ways to store them. Save drawer space and rummaging through to find what you want, for kitchen utensils paint or contact paper a coffee can to match your kitchen, and save the lid to put on the bottom. Place the can on your stovetop and it holds a lot and keeps utensils for cooking handy, and the can is pretty as well!